The Old Mister Boston Distillery was founded In 1933 in Roxbury,Massachusetts and produced gin,rum,bourbon,brandies,cordials,and liqueurs until 1986. Known as a bible of booze, both professional and home bartenders use this guide. 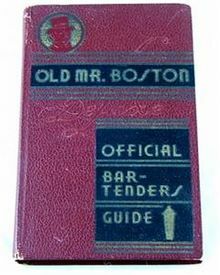 The Mr.Boston company is also known for their collectible bottles. The Sazerac Company of New Orleans currently owns the Mr.Boston name and uses it to import light and dark Virgin Island rums.